Welcome to Casa Ariana - come and spend a week in paradise! Located in the heart of the Swiss Alps, just 90 minutes by car from Zurich Airport, casa ariana offers luxury accommodations at one of the most elegant ski resorts in Europe. 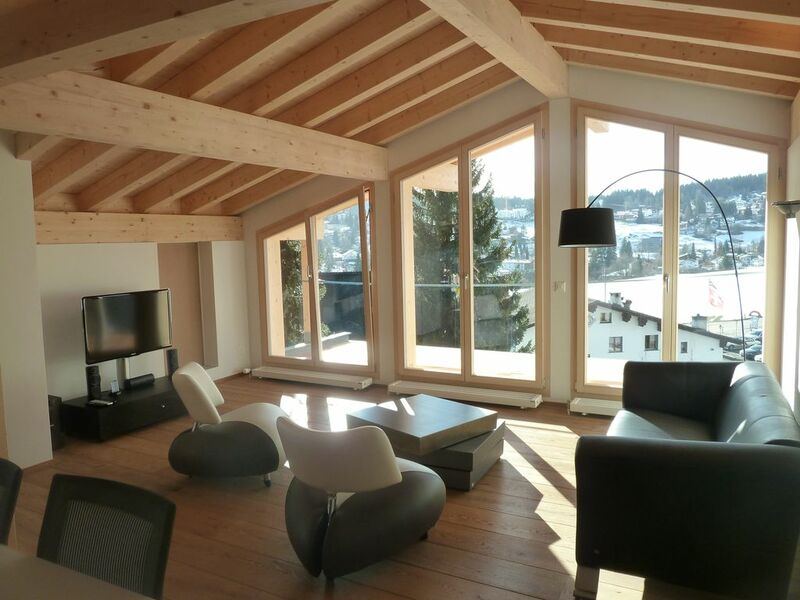 This stunning, newly built, modern and spacious apartment is locatedted in a good and quiet location in Flims-Dorf. The apartment is available for rent for vacation for a minimum stay of one week. The apartment is fully equipped and offers all the amenities one needs for a pleasant and peaceful holiday in the mountains. Ariana 1 - 100m2, 2 big bedrooms, master bedroom with kingsize bed and onsuite bath/shower/wc.Moderen kitchen with open plan kitchen, dining room, lounge. the apartment is located on the top floor (3) and has a big terace facing amazing mountain views. Built as a duplex, you can rent the two apartments (casa ariana 1 + 2, which is comprised 200m2 over 2 floors and are equipped with 10 beds. Definintion der Gebühren (zusätzlich zum Mietpreis): 130 CHF für abschließende Reinigung. 25 CHF pro Person für Bettwäsche und Handtücher pro Woche. Haustiere auf Anfrage Örtliche Besuchersteuer (etwa 4 CHF pro Tag pro Person).